You'll Never Know book 1, by Carol Tyler. Great but somewhat confused biography/memoir. Carol Tyler is attempting to tell the story of her dad in World War II. She is faced with a problem, though. Tyler's dad doesn't want to talk about a certain part of it--his time in Italy. We are given hint that he saw a literal "river of blood," and the trauma has kept him silent for decades. Even his wife doesn't know. Tyler herself is going through her own stuff--an absent husband, a beautiful teenage daughter, life. Tyler is better at short pieces, where she can focus. This is a glorious mess, but a moving beautiful one. The format is unusual too. Tyler uses the horizontal format of a scrapbook. Also, for some reason, the whole thing is not being told in one volume. I will eagerly wait long frustrating months and maybe years for the next volume. 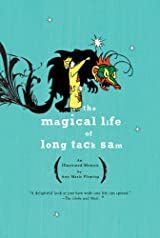 The Magical Life of Long Tack Sam by Ann Marie Fleming. Pretty interesting hybrid graphic novel by a Canadian filmmaker Ann Marie Fleming. It basically takes her research into the life of her great grandfather (which included filming many people who knew him), and jumbling it all up into almost a detective story about the man's life. Her grandfather was Long Tack Sam, one of the great Vaudeville magicians. Stories of his early life in China and how he learned magic are quite confused, and one device she uses is to tell the different versions over and over again as if they were an old biographical comic (these sections were drawn by Julian Lawrence, a really excellent Vancouver cartoonist who has done work for Fantagraphics and his own Drippytown Comics and Stories). The rest is illustrated by with her own relatively crude drawings, stills from her interviews, and archival images of Long Tack Sam and the vaudeville world he lived in. A pretty unique and entertaining project overall. The Perry Bible Fellowship Almanack by Nicholas Gurewitch. This strip has been lavishly praised, and for good reason. The art is incredible, and the strips are usually funny. There is a disconnect between the cute, gentle art and the cruel humor. I like the surrealism, which reminds me in some ways of the panel cartoons of Quino. But Gurewitch utterly lacks the humanity of Quino. To me, his lack of insight makes his humor, which is rather clever, somewhat empty. Don't Tread on my Rosaries by John Bagnall. I love Bagnall's art, but these stories seem a bit blah. As the title suggests, several of them have to do with Catholicism, but not in any compelling way--one is a weird miracle story and the other is a really inconclusive story about a teacher at a Catholic school stalked by a charismatic priest. The book is full of stories that go nowhere--in fact, the best stuff are simply showcases for Bagnall's art--illustrated lists of mundane professions or phrases disappearing from the language. Aya by Marguerite Abouet and Clement Oubrerie. Excellent comic done in the modern French style perhaps best exemplified by Sfar. Unusual in that it depicts daily life in an African country, and especially unusual in that the author is an African. 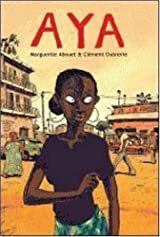 Set in Cote Ivoire during a period of miraculous economic growth (which was undercut in the 80s by declining farm commodity prices), the main character is an ambitious young girl living in a working-class suburb of Abidjan. She wants to be a doctor, so she studies hard and (this is important) avoids getting pregnant. This cannot be said for her wilder friends, who both visit the 1000 Star Hotel (a courtyard with a lot of tables where young folks go to make out and more under the stars). Adjoua gets pregnant, and thinks the father is Moussa, son of a local beer tycoon. This down-to-earth soap-opera like plot continues int he next volume. 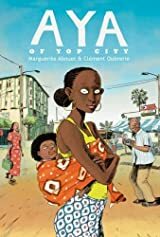 Aya of Yop City by Marguerite Abouet and Clement Oubrerie. This volume takes up right where the previous volume left off. We learn that Moussa is not actually Adjoua's baby's father, and her marriage is anulled. We also learn something rather shocking about Aya's father, Ignace, who is a regional sales manager for Sissoko, the beer tycoon. If this sounds a bit soap opera-ish, it is. But it is also witty and lively, and features some fantastic artwork. This is a depiction of Africa that is rarely seen in any medium. The storylines don't wrap up in this volume, so I assume there is more to come. From the Shadow of the Northern Lights by various Swedish cartoonists. As in any anthology, the quality varies quite a lot in this collection of comics from the Swedish alternative comics anthology Galago. Joakim Pirinen, perhaps the best-known Swedish alternative cartoonist, shows off his chops in a rather slight story. There are the usual number of druggy nihilism stories (think Peter Pontiac or Henriette Valium, with less skill), but several stories that stood out. "A Private Place" by Anneli Furmark is about an artist who decides to go live in a relatively isolated cabin, where he is having a crisis of confidence in his own abilities. It's about working through that. Then just the opposite is the talky story "Henry Says" by David Liljemark. His artistic chops pale compared to Furmark, but he is able to make a long story about people talking in a bar completely fascinating, revealing, and believable. The collection is well-worth reading. Journey volume 2 by William Messner-Loebs. The typically peripatetic Wolverine MacAlistaire stays in one place in this volume--New Hope, a struggling hamlet on the west side of Michigan. This village conceals a good many secrets, and MacAlistaire, along with the failed poet Elmer Alyn Craft (who was introduced in the first volume), are stranded there for a winter--MacAlistaire because he is wounded, Craft because he would have no hope of surviving outside civilization, even civilization as meager and tenuous as that in the inaptly named New Hope. This village is claustrophic and full of horrible secrets. Craft is obsessed with finding them--MacAlistaire is only interested insofar as it will help him survive until he is well. Messner-Loebs' drawing has lost what little polish it exhibited in the first volume. It becomes ragged and urgent here, fitting the psychologically intense and unsettling story. This is one of the classics of the 80s, and very much worth rediscovering. 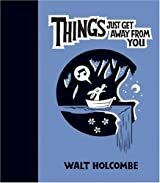 Things Just Get Away from You by Walt Holcombe. Walt Holcombe is a charming cartoonist. His work recalls classic 20s and 30s comic strips and animation. My problem is that in his coy, cute stories, I really find myself not caring. It's pretty to look at, but I just don't feel any connection with the characters and their stories. The Portable Frank by Jim Woodring. I have read all of these stories many times before in various formats. This is a great presentation for them--simple, inexpensive, it lets the work speak for itself. If you haven't experienced Woodring's surreal comics, this is the best place to start. Frank is an anthropomorphic cartoon of indeterminent species, and he acquires a vastly loyal pet, Pupshaw, and encounters various other inhabitants of his world, a world infused with spirit. The characters all have symbolic meaning but I have no idea how to decode this forest of hermetic signs. The mystery is part of the appeal. Cecil and Jordan in New York by Gabrielle Bell. Very good--Bell's art is outstanding in a non-showy, matter-of-fact way. In some stories, she never shows you someone's face in a close-up, and in some of her autobiographical stories, almost ever character is drawn full-figure--in other words you see their feet and heads in every panel they are in. The distance from the observer and the characters is pretty large. It's a weird way to tell an autobiographical story--it's as if the author was pretending not to know what was going through the mind of the character. It creates an interesting contradiction, as if Bell was alienated from herself. That feeling carries through in her fiction stories too. The characters seem to feel disconnected from their lives, even as they have what (on the surface) seem like pretty engaging experiences. Her characters never get happy, which can be kind of a downer for the reader. The title story even features a character who would be happier as a chair--she'd feel useful that way, and not have to struggle the way she did when she was a full-time girl. Humbug by Harvey Kurtzman, Jack Davis, Al Jaffee, Arnold Roth, etc. Humbug has long had a reputation as Harvey Kurtzman's masterpiece, an obscure magazine with a very brief run, in which Kurtzman had full control and a stable of hugely talented artists and writers. This loving new edition demonstrates how legendary but little-known works can get reputations way out of proportion with their modest merits. Humbug isn't bad, but it surely doesn't seem better than Kurtzman's Mad. I'd contend that the Goodman Beaver strips from Help! are superior to just about anything in Humbug. There are some truly enjoyable pieces here, and Jack Davis's artwork is at a real peak--a joy to look at. But Humbug was never going to make people forget Mad. In fact, Humbug seems like Mad continued. The things being parodies are a bit more adult, but Kurtzman's approach to parody and satire remains the same. Only the R.O. Blechman pieces represent a decisive break in style and approach from Mad. I greatly admire the skill and care that the publisher took in reproducing these pages--retypsetting and recoloring where necessary, and using original paste-ups when possible. I prefer this by far to the "photograph an original printed page" approach that some reprint collections have used, apparently in some mistaken notion of fidelity to the original. A Drifting Life by Yoshihiro Tatsumi. 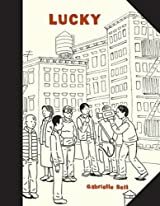 Yoshiharu Tatsumi is, for me, the only really great alternative manga artist yet published in the U.S. (There are several others who are good and interesting, but I define greatness as having the kind of rereadability as Love & Rockets or many Crumb pieces. It's a highly personal definition.) This mammoth autobiography (834 pages) only covers his life up through the early 60s, but generally the detail is useful. A Drifting Life really lets you understand what went into his future work. I think there is an interesting parallel between this ol Japanese artist (born in 1935) and modern alternative American comics artists. He, like many of his American counterparts, began life as an active fan-boy. He belonged (and help establish) what must have been one of the first manga fan clubs. He was drawing his own manga at an early age, even getting some published while still in Junior High. Like Robert Crumb, he was egged on by his brother, who early on seems unstable. But this is a result of a chronic illness that is later cured by a new drug from the U.S.A. His brother becomes a fairly successful manga artist in his own right. Unfortunately, this work is just not as good as his classic short stories, collected in The Push Man, Goodbye and Abandon the Old in Tokyo. These gritty urban working-class vignettes are profoundly moving, and done with a light hand. A Drifting Life, on the contrary, is extremely self-conscious. Tatsumi rarely uses narration in his fiction comics, and in A Drifting Life, he talks about learning this from reading about movie scripts. It's ironic then how much he uses clunky, unnecessary narration here. He literally tells the reader how his characters are feeling--this shows a huge lack of trust in his readers. Likewise, he exhibits a desperate need to show how he influenced other famous manga artists. There is one scene where we see artist Yoshiharo Tsuge (who plays no part in the story) being consciously influenced by Tatsumi's ground-breaking anthology Shadow. I understand that Tatsumi might be proud that he influenced Tsuge (a great great artist), but including these scene just seems like heavy-handed self-aggrandizement. All that said, this was a really compelling story. Its faults don't change that. I definitely recommend it. 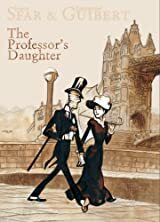 The Professor's Daughter by Joann Sfar and Emmanuel Guibert. This is a slight work by two cartoonists who have much better solo work. Written by the hyper-prolific Joann Sfar (cartoonist of The Rabbi's Cat, Vampire Loves, and many others) and draw by Emmanuel Guibert (cartoonist of Alan's War), the book resembles Vampire Loves in centering around the romantic life of a horror movie staple--in this case, the mummy of Imhotep IV in his quest for love with Lillian Bowell, daughter of the archeologist who found Imhotep and brought him to England. Sfarr's loose drawing style made this kind of picaresque romantic comedy work in Vampire Loves, but it just never meshes with Guibert's much more controlled style--which is so perfect for the documentary-like Alan's War. In short, two wonderful artists who are not really great collaborators. The Complete Terry & the Pirates vol. 6 by Milton Caniff. This is the last of Terry. Caniff had signed a contract with Marshall Field to create a new strip that Caniff would own. So here he was running out his Terry contract. The war ends, and Caniff contrives to make Terry an intelligence officer working undercover in China as a pilot for a ramshackle charter airline run by Chopstick Joe (last seen before the war). The Chinese civil war is mentioned, but it seems to impact the characters not at all. There are, curiously in my opinion, no communists in Terry's China. Prior to and during the war, there were nationalists soldiers, including the Dragon Lady, Hu Shee, and others. But after the war, even the Nationalists disappear. The Dragon Lady reappears for a final bow more with a whimper than a bang. She has gone from leading an army of Nationalist guerrillas to being a simple criminal. Other former characters are brought in for a final bow. Burma makes a rushed appearance at the very end that is pretty good. She seduces Terry, but at the same time there is a recognition that she is old. And an old whore is a sad thing. I know the strip was continued after Caniff left, but I like to imagine that when he left, he left their stories open. What do these characters do in the Chinese civil war? What sides do the Dragon Lady, Hu Shee, Connie, and Big Stoop take? Does Terry go back to the U.S. (where he hasn't been since he as 12 or so) to marry April and become an "organization man" in a grey flannel suit. Is Pat tamed (or imprisoned perhaps) by Normandie Drake, and does Normandie turn into her tight-assed mother Augusta, seeking a respectability that Pat is loathe to provide? This final volume is as handsomely produced as the previous volumes. Buying them all will set you back about $300, but it is well-worth it to be able to read the entirety of this great American comic strip. Get Your War On: The Definitive Account of George Bush's War on Terror 2001 - 2008 by David Rees. This collection is exhausting. In bite-sized chunks, these scabrous strips are funny, but read all at once, they really depress you. David Rees's shtick is that he uses the most utterly banal clip art characters, over and over, to reflect profanely on the absurdity and horror of the War on Terrorism. Right from the start, he seems to oppose American intervention in Afghanistan. Iraq of course sends him over the edge. These strips are sarcastic and snarky to the extreme. If they went a hair further than they do, they just wouldn't be funny. But they are funny. Rees has a flair for over-the-top dialog. He gets his biggest hate-on when talking about "liberal interventionists" like Michael Ignatieff, who's "mea culpa" essay he eviscerates line by line. Humbug was a real treat! And I agree that it was Jack Davis at his peak. An amazing production as well.